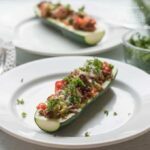 These colorful stuffed zucchini boats are a savory and delicious dinner packed with lean protein and a healthy serving of vegetables. 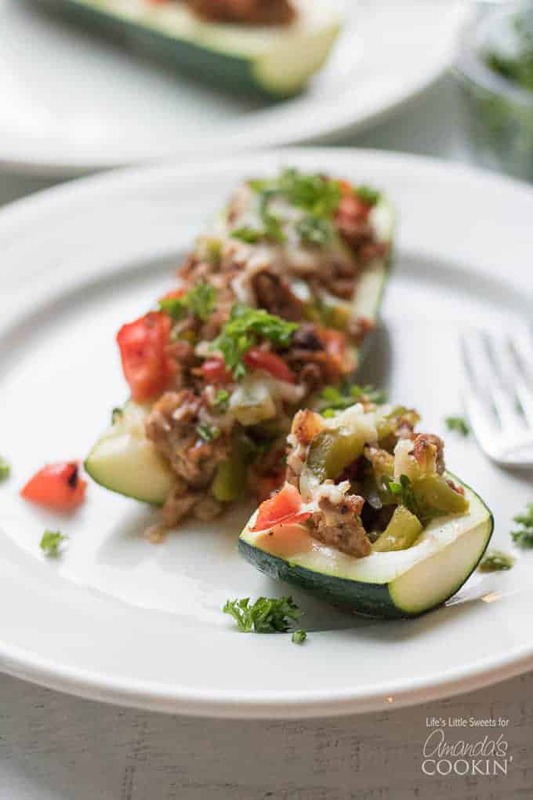 Stuffing zucchini with lean ground turkey, fresh peppers, onions, and grated cheese makes for a tasty low-carb dinner and is a great way to use up all that garden zucchini! Every fall you hear the same question: “How do I use up my summer zucchini?” The old standbys include zucchini bread (and variations like lemon zucchini bread and chocolate zucchini bread), zucchini muffins, spiralized zucchini, and the list goes on! This recipe for zucchini boats is a great way to use up a bunch of zucchini and you can double or triple it for a large crowd or party. Stuffed zucchini can be eaten with a knife and fork or just with your hands, making it a great, family, picnic-friendly, kid-friendly food. It comes together quickly on the stovetop before being baked in the oven making it one of those easy recipes for a weeknight dinner. You can customize this recipe with your favorite type of shredded cheese (I used an Italian 3 cheese blend). Change it up even more with your favorite veggies beyond onions and bell peppers. 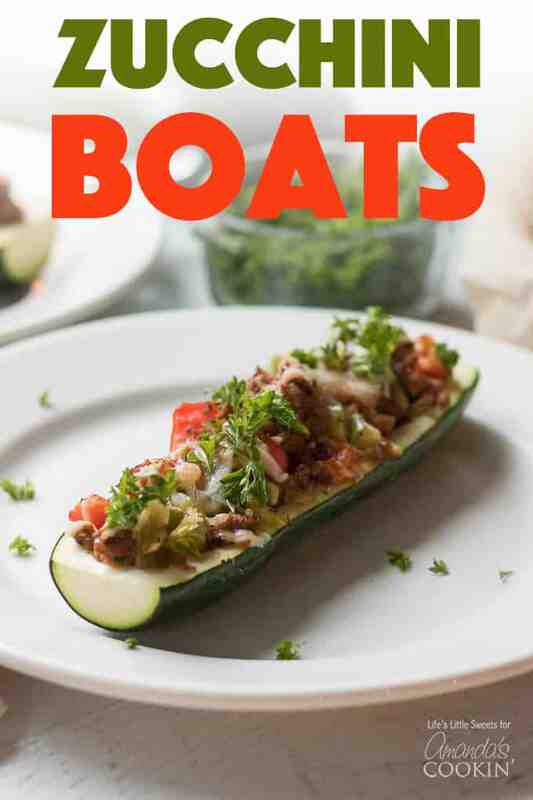 How many calories are in a zucchini boat? Our zucchini boat recipe uses lean ground turkey but you can use lean ground beef, chicken, pork or Italian sausage. 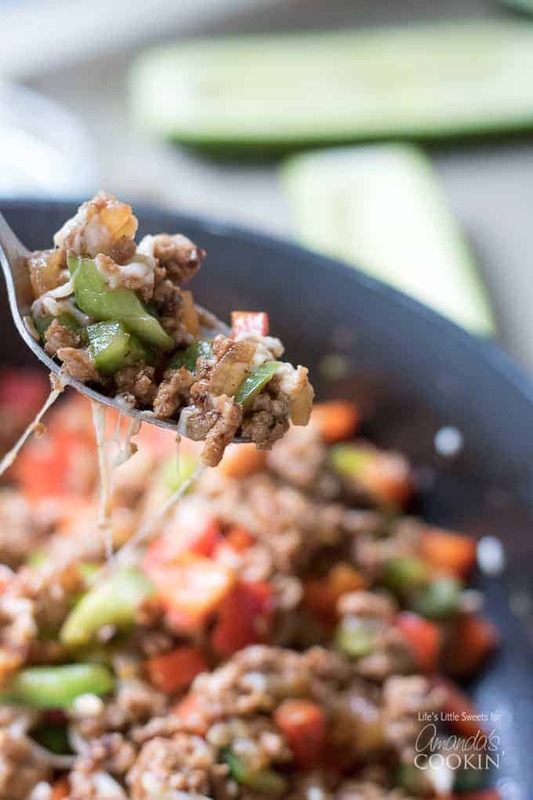 Just keep in mind that the calories stated in this recipe are based on ground turkey. If you change the meat, it will change the calorie count. 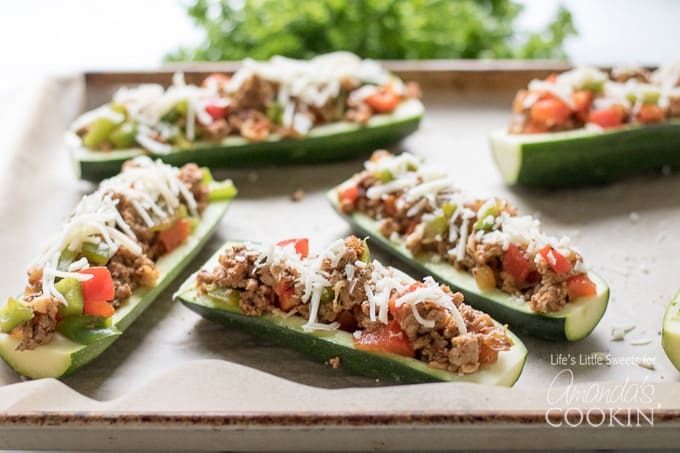 There are 355 calories for two zucchini boats with ground turkey (one zucchini = 2 halves). So there are 178 calories in one zucchini boat. You can find zucchini in most grocery stores all year round, but it is in season during the summer, peaking in June through late August. Medium zucchini – you can substitute yellow squash or even eggplant. We have a stuffed eggplant recipe as well! 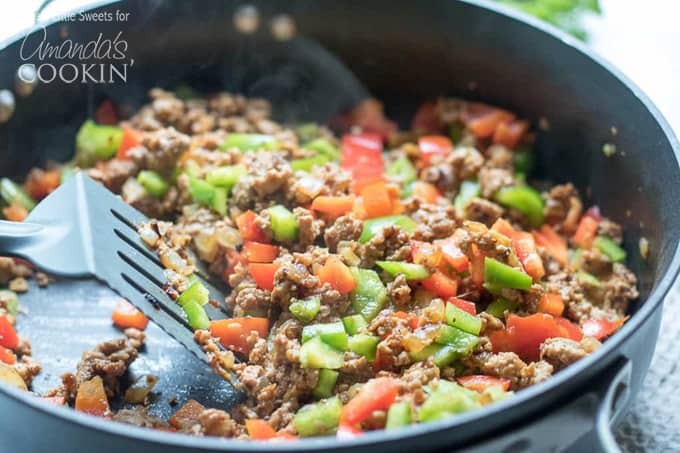 Lean ground turkey – other options include ground beef, ground chicken, ground pork, or ground sausage. Extra virgin olive oil – you can use other olive oils since it’s such a small amount, but extra virgin olive oil is the best choice for sautéing. 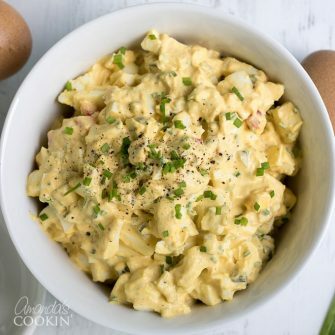 Yellow or Vidalia onion – any white or yellow onion will be fine for this recipe. Red bell pepper – if you prefer you can use orange or yellow bell pepper, we use red because it has the biggest pop of color! 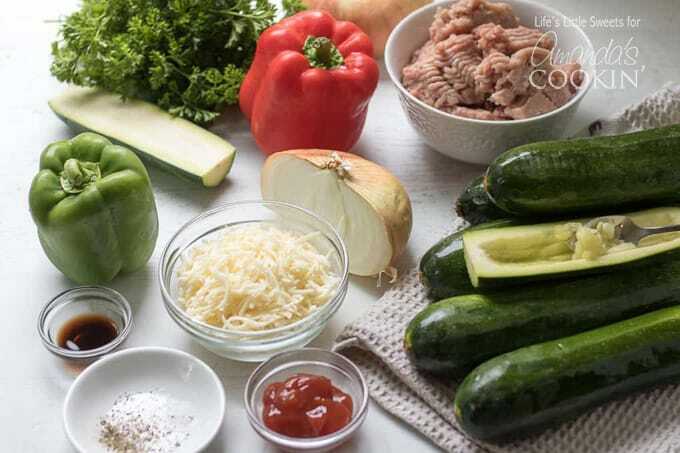 Green bell pepper – some people have digestive issues with green pepper, simply substitute a different color of bell pepper. Ketchup and Worcestershire sauce – these ingredients add flavor to the meat mixture. Shredded cheese – you can use any of your favorite shredded cheeses. We used an Italian 3-cheese blend, but Mozzarella or cheddar would be delicious and a pepper jack would add some kick! Kosher salt and fresh ground black pepper – use for seasoning, you can use regular table salt if you don’t have Kosher. Kosher salt has larger granules and does not measure the same. If you want to use table salt, measure 3/4 teaspoon to replace 1 teaspoon of Kosher salt. Fresh parsley – used for garnish only so you can leave this out if you like. We used curly parsley, but flat (Italian) parsley works too! So how do you make stuffed zucchini? It’s super easy and so tasty! Let’s get started. And remember, you can print the recipe at the end of this post. In a large skillet, over medium-high heat, add 1 tablespoon olive oil and the chopped onion. Cook the onion until almost translucent, then add the lean ground turkey, zucchini pulp, ketchup and Worcestershire sauce. Stir occasionally and cook until browned (about 3-5 minutes). Add the chopped green and red bell pepper. Meanwhile, trim the ends off the zucchini then slice them in half lengthwise and scoop out and reserve the pulp. 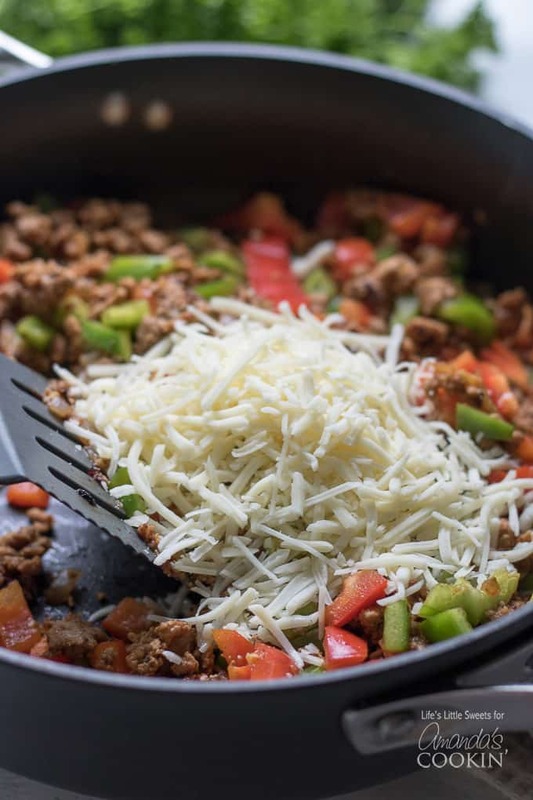 Remove the skillet from the heat and stir in 1/2 of the shredded cheese. Spoon the mixture evenly into the halved zucchinis. Sprinkle the tops with the remaining shredded cheese. Bake (uncovered) at 350 degrees F for 20-25 minutes or until the zucchini is tender. Allow baked zucchini boats to cool for a few minutes before enjoying. For a pretty finish, sprinkle with chopped parsley and serve! 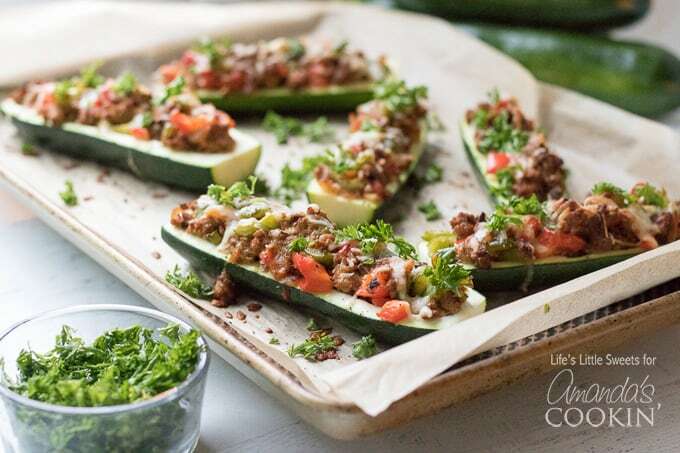 If you’re looking for a low calorie, low carb meal, try our stuffed zucchini boats. You won’t be disappointed! Do you love using veggies in place of higher calorie options? Or even just as a vegetarian option? You’ll love our General Tso’s Cauliflower recipe for a healthier take on a classic Chinese dish everyone loves! Aside from the zucchini bread and muffins I mentioned above, you may also like this Simple Zucchini Tomato Pasta, our Crispy Zucchini Fries, and this popular Grilled Corn and Zucchini Salad! 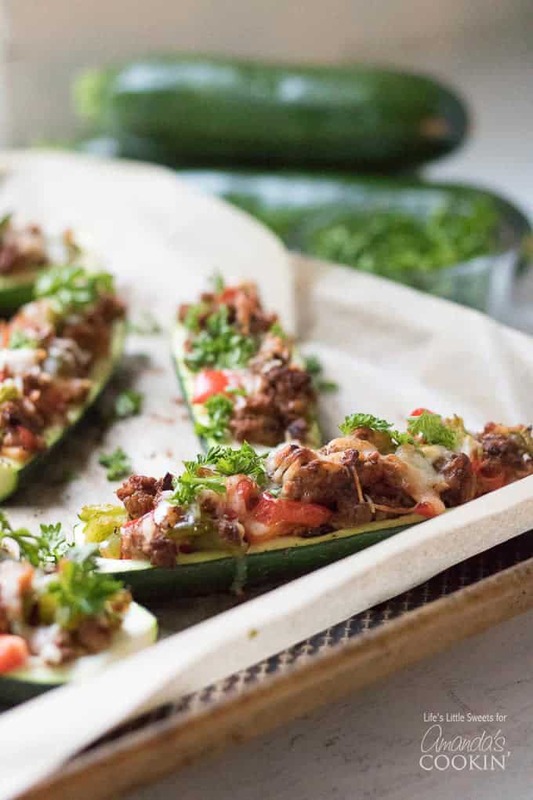 Stuffed zucchini boats are a savory and delicious dinner packed with lean protein and a healthy serving of vegetables. 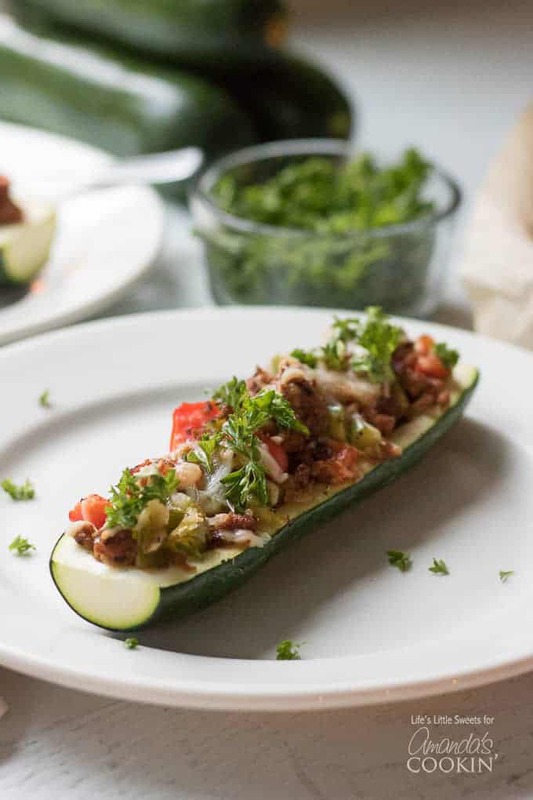 Stuffed zucchini = low-carb dinner! In a large skillet, over medium-high heat, add 1 tablespoon olive oil add the chopped onion. Cook onion until almost translucent. 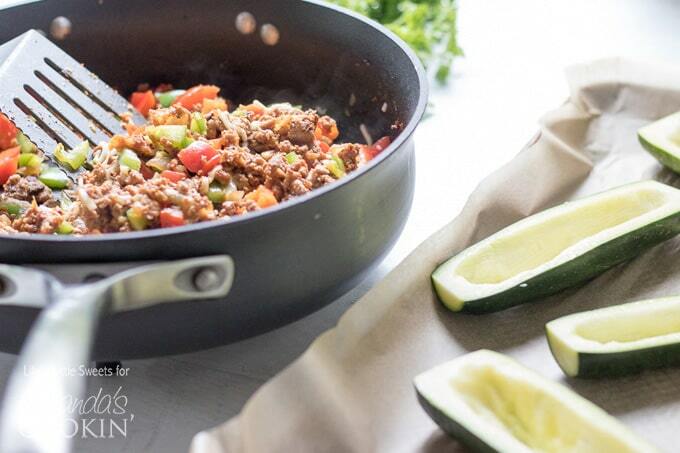 Add the lean ground turkey, zucchini pulp, ketchup and Worcestershire sauce. Stir occasionally and cook until browned (about 3-5 minutes). Add the chopped green and red bell pepper. Remove from heat. Stir in 1/2 the shredded cheese. 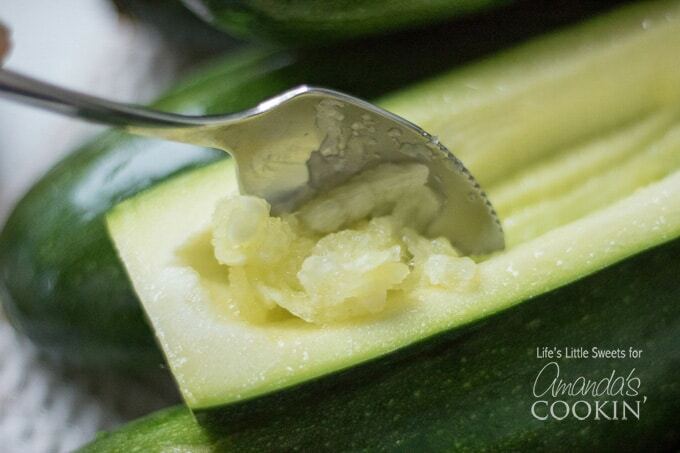 Spoon the mixture evenly into the halved zucchinis. Sprinkle the tops with the remaining shredded cheese. Bake (uncovered) at 350 degrees F for 20-25 minutes or until the zucchini is tender. Allow it to cool for a few minutes then sprinkle with chopped parsley and serve.